Welcome to the third part in our series of troubleshooting articles dedicated to the iPhone 6. This model is one of latest model of Apple that is released running on iOS 8 straight out of the box. While it indeed comes with several great features it also has its fair share of issues which owners of the device are experiencing. In this latest installment we will be looking into some of these issues that some of our readers have sent us. If you own an iPhone 6 or any other iPhone model for that matter then feel free to send us an email at [email protected] regarding any issues you are facing with your phone. We will be more than happy to help you with that. This is a free service we are offering with no strings attached. We however ask that when you do send us an email try to be as detailed as possible so that an accurate assessment can be made and the correct solution can be given to you. Problem: Someone else’s Apple ID is showing up as mine while I’m activating my new iPhone 6. Why is this happening and how can I resolve. The phone was bought from EE so should be brand new. Solution: It appears that this phone may have previously been used and returned. Return it to the store you got it from and ask for a new one. When you get your new phone check its activation lock status on this website https://www.icloud.com/activationlock/. This helps ensure that you won’t run into the same problem again. 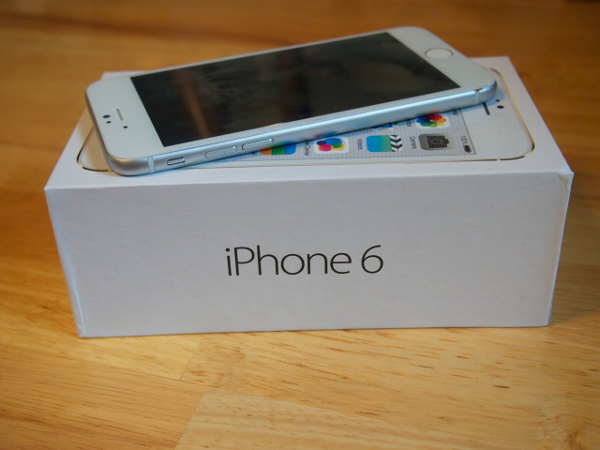 Problem: I just got my new iPhone 6. I am having problem of low volume when on a call. Cant hear clearly. What to do? Solution: When you are on a call and you can barely hear the person on the other end try following the steps below. Turn up the volume: In most cases the problem in this type of issue is that the volume is set too low. Press th volume up button to increase the sound. Make sure that you can see the volume indicator increasing on the display. Check your phone connections: Make sure nothing is connected to the 3.5mm jack. You should also try turning off your Bluetooth. Do the following steps below proceeding to the next step if the issue is not resolved. Make sure nothing is blocking the receiver, such as a case or film. If you have a new iPhone, remove the plastic film on the front and back of the device. Check the receiver opening to see if it’s blocked or dirty. If necessary, clean the receiver opening with a clean, small, dry, soft-bristled brush. While you’re on a call, turn on speakerphone. If you still can’t hear, then your network or reception could be the issue. Try calling again later or from a different location. If the issue persists restart your phone then check for any latest software updates. If nothing else works then you should bring our phone to the nearest Apple Store for checking. Problem: When my iPhone 6 is plugged in and connected to my wifi network it slows the entire network down. All other devices connected to the network can no longer access the Internet. What’s strange is that when my phone isn’t plugged in and connected to wifi everything works fine. This only happens when it’s plugged in and connected to wifi. I checked to see if it was the iPhone backup causing the problem (due to a backup potentially hogging upload bandwidth) but this doesn’t seem to be the case, my iPhone isn’t in the process of a backup when this is happening. Any idea what’s causing this? Solution: From the way you describe the issue it is definitely your phone that is the cause of the network slowdown. Have you checked if any apps in your phone are accessing the Internet? You should also check if there is a conflict of IP address between the devices connected to your router. As a last course of action you may want to try to restore your phone to its original settings. Make sure to perform a backup first as this procedure will delete all your phone data. Scroll to and tap General. If prompted, enter the Apple ID Password, then tap Erase. The device is reset and ready to use. Problem: I have purchased brand new iphone 6, it shuts down when not in use by itself, I have to hold the top and bottom buttons for 10 seconds a do a hard reboot to get it back on, this has happened 7 or so time in the last week or so, called Apple Support, and they don’t know what is causing it and I am the only one that seems to have this problem and what might could b the issue. Solution: Since a hard reset doesn’t seem to resolve the issue then this may already be a hardware relate problem. You should bring your phone to the nearest Apple Store for checking. Alternatively, since this is a new phone you could bring it back to where you bought it from. Problem: I am trying to sync all my info onto my new IPHONE 6 but as i get half way through I get an unknown error 53 and my iphone is stuck in recovery mode, I cannot turn it off or on. Any ideas on how to fix this? Solution: When you get an error while trying to restore your phone it is important to follow the steps below to try to resolve the issue. Get the latest version of iTunes on your computer. Install available updates for your Mac. If you have a PC, you can get PC software updates from the Microsoft website. You might need to update, change, disable, or uninstall software that’s causing an issue. Keep only your iOS device, keyboard, and mouse plugged in directly to your computer. Turn off your computer and your device. Then turn them on again. Update or restore your iOS device again. While the error 53 is not yet listed on the Apple website this error signifies a hardware issue which most likely deals with the Touch ID button. If the issue still persists then you should bring your phone to the nearest Apple Store for checking. Problem: At my house, sometimes my Apple TC3 5 GHZ network doesn’t appear on my iPhone 6 (but does on my wife’s 6 Plus and my iPad Mini). If I hard reboot the phone by holding down home and side button, it shows up when the phone reboots. I also have the same problem with the 2.4 Ghz network I use to connect to my drone. That network shows up right away on other IOS devices but not on my iPhone 6. Could this be a defective WiFi radio or is this probably a software issue? Solution: You should first try to reset all your network settings as this is known to help resolve this type of issue. Go to settings – general – reset – reset network settings – you will need to reenter known wifi password. If the issue persists then do a hard reset on your phone. Make sure to backup your data first before proceeding. If the issue till persists after a hard reset then this may already be a hardware related issue. You should bring your phone to the nearest Apple Store for checking. Problem: I noticed that when I tried to access “Send My Current Location” in Messages” that I could no longer open the messages from the person I was messaging. Then I have an app called FlightRadar24 and it uses Maps and it won’t open…. and finally I put 2 and 2 together…….I realized after I touched the icon for “MAPS” it begins to start and then immediately shuts down and returns to the original page of apps…HELP…Maps has a bug!! What can I do to fix this? I have done a reset with the Home button and the side Button, and the problem persists. Is someone from Apple going to fix this?? I also have GOOGLE MAPS.. Is Google Maps killing this app? Solutions anyone?? I can’t open my daughters messages. Solution: Try doing a restart first and if that does not resolve the issue then proceed to resetting your phone. You should reset your device as a last resort and only if you can’t restart it. To reset, press and hold both the Sleep/Wake and Home buttons for at least 10 seconds, until you see the Apple logo. Problem: Hi. After applying the last upgrade on my iPhone 6 the touch id stopped working and started to be hot from nothing. I try to go to settings and enable the touch ID back but always receive the same message: “Failed, unable to complete Touch ID setup. Please go back and try again”. Tried to restart the iPhone several times but still unsuccessful. Didn’t try restoring the iOS though… it looks more like a hardware problem? Does anyone is having the same issue? Solution: The first thing that you need to do is to reset your phone by by holding the sleep and home button for about 10sec, until the Apple logo comes back again. If that does not work you will need to erase your phone and set it up as a new one. Backup your data first before you erase your phone. To remove all settings and information from your device, tap Settings > General > Reset > Erase All Content and Settings. You will need to setup your phone as a new device by following the instructions displayed on your phone screen. Problem: I got my iphone 6 in Oct. and had no problems. Yesterday I tried to connect it to my computer and I got “this accessory may not be supported” message on my phone and it will not charge to my computer. It will in the wall and in my car. ITunes and windows 7 still recognizes it as my iphone but it will not charge on the computer. I ran all the windows drivers updates etc to see if it was a computer problem and I don’t think it is. I tried different USB ports and different cables as well to no avail. Any other ideas? Solution: Try connecting your phone to a different computer and check if the error message still shows. If it does then do a hard reset on your phone (make sure to backup your data). If after the hard reset the issue still occurs then you should bing your phone to an Applle Store for checking. If you have any concerns regarding your iPhone feel free to email us at [email protected]. We will provide you with free technical support regarding the issue you are facing with your device. Just make sure to provide as much detail as possible so that we can make an accurate diagnosis. I am having a problem with my email. After 7 days the mail in my inbox disappears. it is set up as an IMAP account. I have not been able to find any settings that would cause this to happen. I have tried to delete and reenter the account, rebooted the phone and spoken to both Apple and my service provided. Any suggestions?